Seeing new and faster muscle gains doesn’t necessarily require getting on a drastically different workout plan or following a super-scientific diet. Small changes can add up to major muscles building. Start making the following tweaks and gain muscle faster. Many people ask me “what is the best way to build muscle fast?” So, I thought why not write a paper on this. Acquiring new and faster muscle gains doesn’t always require going for a radically different workout plan or following a highly-scientific diet. Even little changes can deliver major gains. The basic truth is: “Muscles that you use most tend to get stronger and muscles, which you don’t use often, get weaker/smaller.” So, the first fundamental ground rule is that you need to make use of the muscles you want to make stronger and larger. Now, there are number of sports, exercises, and techniques that will pump blood in your muscles and make them grow bigger. Here are the best tips to help make your muscles bigger and better-toned in the minimum possible time frame. 1. Check The Number Of Calories You Require To Grow Bigger: Your calorie needs depend on your age, gender, current weight and how active your lifestyle is. The thumb rule is, multiply your current weight in pounds to 20. If you weigh 145 pounds (66 kg), you optimally require 145×20 = 2900 calories every day. This perhaps will shock you if you’re not used to eating that much in a day. Training hard won’t translate into new muscle unless you’re eating sufficient calories. Keep a food journal to maintain track of your calories. Write down everything that you eat and drink, along with the time of the day. If you’re not gaining muscles, check how much calories you are eating and try to figure out where you can sneak in more calories to help you build muscles faster. 2. Exercising Big Muscle Groups Is A Faster Way To Build Muscles: Studies have found that training big muscle groups triggers the muscle gaining activity, resulting into quicker and larger muscle gains. The largest muscle groups are the leg, back and chest muscles. Total Fitness Tip: Concentrate on compound exercises. Exercises that work muscle at more than one joint are called as compound exercises (compound lifts). These include the deadlift, squat, press, row, and chin-up. Compound lifts recruit lots of muscle mass, making up for effective training and a vast release of hormones like testosterone that trigger growth. Make such exercises the foundation of your workouts. You can throw in some isolation work (curls, leg extensions) as well, but consider them like dessert after you’ve had your main course of compound lifts. 3. Workout Progressively: As your muscles adjust to the heavy load, you will need to shock them by regularly altering the weight you lift. If you used 100 pounds on your bench press during your first week of training, attempt to increase 10 pounds for the second week. Enhance by another 10 pounds on the following week and so on. The same strategy goes for other body parts. Progressive workouts ensure that your muscles don’t get complacent and pause growing. The added weight communicates to your body to build more muscle fibers to keep up with the load. Enjoy your muscle growing bigger and stronger every week! 4. Don’t Ignore Building Up Leg Muscles: Even if your aim is just to get a big chest and arms, you should not ignore training legs. Firstly, imbalanced muscles look awkward, and secondly, heavy compound lower body exercises such as the deadlift have massive impact on your overall muscular growth, even in your upper body. That’s because they engage muscles everywhere—even in your shoulders and back—and they stimulate the release of hormones that build size and strength. (i) If you’re working out three times a week training two body parts each day, consider to spread it out to six days working only on one body part more extensively each day. (ii) If you’re working out four days per week, consider an upper/lower split so that you hit each muscle twice a week with about five sets each. Increasing the frequency with which you’re training each muscle will let you achieve strength and muscle gains more quickly. (iii) If you only lift weights three times per week, consider switching to full-body workouts, so that you train the entire body in each session. This way, you’ll work on each muscle three times per week. Perform two to three sets per muscle group. (i) Whey Protein Powder: This supplement is virtually always needed if you want to gain big, lean muscles, pep up your performance, and trim body fat. Whey protein is an integral part of your muscle building armory. It is easily digested and absorbed by the body. (ii) Casein Protein: Casein is the twin brother of whey. It’s the other type of protein found in milk. Compared to whey, your body digests casein slower. Taking casein before bedtime averts catabolism, saving your hard-earned muscles from being converted to body fuel. (iii) Creatine: Creatine is one of the latest discoveries in the arena of sports supplementation. It augments the amount of energy furnished to your muscles so you can do more repetitions and lift heavier weights. (iv) Branched-Chain Amino Acids (BCAAs): Leucine, valine and isoleucine, together called as branched-chain amino acids are the utmost critical amino acids for repairing and building muscle tissue. (v) Glutamine: Glutamine is the most abundant amino acid in your body. It enhances the amount of leucine in muscle fibers and reduces muscle breakdown. It has also been proven to improve the immune system. 7. Drink A Shake During Workout: Pre- and post- workout nutrition gets a lot of attention, and rightly so as both are essentially needed. But if your goal is to build muscles faster, drinking a shake with protein and carbs during training is a good way to sneak in some extra calories without having a meal. Mid-workout nutrition will provide you a swift shot of carbs and calories, which will maintain your energy up and help you train harder. However, take care to be conservative with the amounts you intake so you don’t upset your stomach. Start with a modest shake of around 15-20g of protein and 30-40g of carbs. 8. Eat More On Off Days: Just because you’re not training on your off day, doesn’t mean you shouldn’t eat big. It may sounds strange to you, but in fact on your off days most of your muscle growth takes place—the recovery phase — so you need to eat plenty of nutrients for the body to make the most of. It’s all right—and probably wise— to reduce your carb intake marginally on non-training days, as you don’t require the extra energy for working out, but keep your protein intake high and ensure your overall caloric intake doesn’t decline by more than 500 calories. 9. Don’t Afraid Of Carbs: Low-carb-diets are widely accepted for losing body fat, but they’re somewhat the opposite of what you require to grow muscle. To attain big muscle, you shouldn’t fear to gain a slight fat, and provided you’re eating clean food and sufficient calories to grow—but not too many—a slight fat is all you’ll gain. To start with, include carbs in your pre-workout meal and post-workout meal, as well as in the shake that you consume during workouts. From there, you can add or subtract carb meals depending on how you’re progressing toward your goals. 10. Go To Bed 30 Minutes Earlier: Recovery is essential for growing muscle, and there’s no better way to recoup than by simply sleeping more. In an ideal world, you’d get 8-9 hour of sleep a night, but that’s not always realistic. You can, though, control when you go to bed so as to provide you the best prospect of getting as much sleep as you can. Record the TV shows that would otherwise keep you up and mess up with your endeavor. During your off days, you can do aerobic exercises like running or walking. Doing aerobic exercise is a great way to trim fat. Just don’t do your cardio during weight training days or you may also be burning your hard earned muscles. Conclusion: Building big muscles that look great takes time. In a normal course, you can expect to gain only 5-10 pounds of muscle annually. But if you stick to the tips suggested above, you will positively gain good and long lasting muscles in shortest possible time frame. Best wishes and enjoy big muscles building! 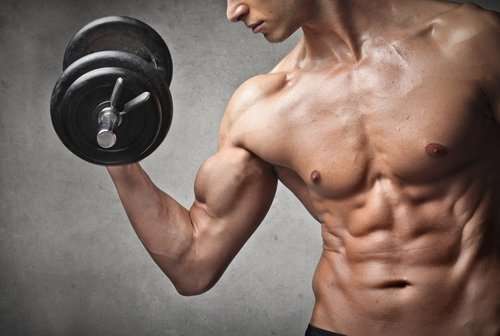 What methods you are using to build muscle mass fast? Share your tips with our other readers under the comment section. Great tip about going to sleep earlier!